Colin Watt was born at Mile End, a suburb of Adelaide, on 14 October 1921. He joined T & G Mutual Life Insurance Society in July 1937 and had no intention of learning to fly until the war broke out and he sought to join the RAAF. He was accepted by the RAAF Reserve in Adelaide in July 1940 and sworn in on 1 February 1941 when he was posted to Pearce for initial training on 11 Course Empire Air Training Scheme. He then went to Cunderdin for elementary training on Tiger Moths and to Geraldton for service training on Avro Ansons. His Wings were presented on 24 July 1941. He was 19 years old. He departed Adelaide on 10 October 1941 to embark in Sydney on the Matson liner Mariposa, via New Zealand and Fiji to Honolulu (where he had a day ashore, six weeks before Pearl Harbour), then Los Angeles. He travelled by train up the coast to Vancouver and across Canada to Halifax, where he travelled in a 9-ship escorted troop convoy to England. He arrived in Bournemouth on 23 November after 37 days en route – fast travelling for the time. In January 1942 he was posted to a Beam Approach course at Coningsby where 106 Squadron were flying Hampdens and 97 Squadron Manchesters, having received their first Lancaster only a fortnight before. After completing the course he went back to Bournemouth and, at the end of February, was posted to 2 AFU (Advanced Flying Unit) at Brize Norton. The course there was a mixed lot – with one Englishman, one Scot, two brothers from Guatemala in the RCAF, numerous Americans who had joined the RCAF before America came into the war, three South African officers, Canadians, New Zealanders and Australians. His next posting was to 14 OTU (Operational Training Unit) at Cottesmore, the 5 Group Hampden OTU. 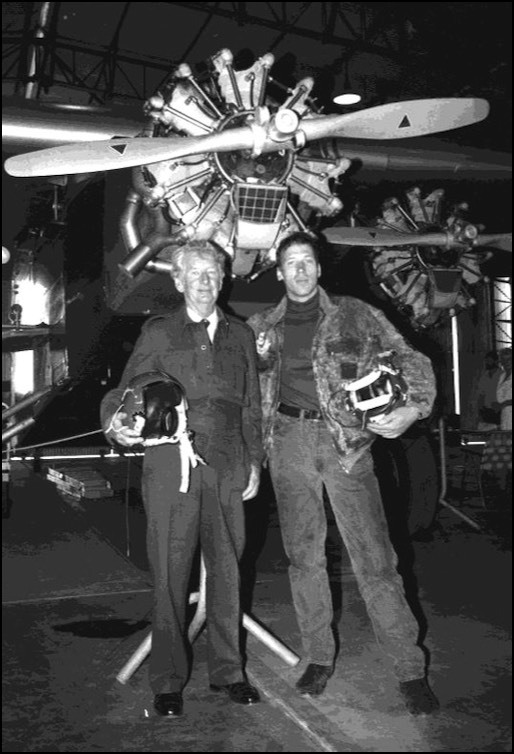 First he undertook day and night flying in Oxfords with four sodium lights to simulate a flare path, sodium light over the instrument panel and blue goggles – which he says was the best night flying training he has found anywhere since. After that, because there was no dual in Hampdens, he had plenty of cockpit drills in a static aircraft. Then flying started. The instructor demonstrated the aircraft with the under training (u/t) pilot sitting on the main spar behind the pilot’s seat, peering around the armour plating. The instructor demonstrated normal circuits and single engine circuits. The u/t pilot then talked him around the various circuits until the instructor was satisfied, whereupon he hopped out and the u/t pilot took over solo - except for a very nervous WAG (Wireless Air Gunner) sitting in the back. He was on the junior course when the senior course went on the first thousand bomber raid to Cologne, followed two nights later to Essen. During the next moon period on 25 June 1942, however, he went to Bremen in a Hampden. The thousand bomber force was reassembled for this raid, although only 960 actually participated. They included every aircraft type in Bomber Command: Wellingtons, Halifaxes, Lancasters, Stirlings, Blenheims, Hampdens, Whitleys, Bostons, Manchesters and Mosquitoes. An additional 102 Coastal Command Hudsons and Wellingtons and five Army Co-Operation Command aircraft carried out what were classified as separate raids on Bremen, so the total force of 1,067 aircraft actually exceeded the number on the previous Cologne raid. Forty eight Bomber Command aircraft were lost, or 5% of the total, which was a new record loss. Five of the Coastal Command aircraft were also lost. Although Colin’s WAG had been on the two previous ops, his English navigator, New Zealand bottom gunner and he, had never seen a shot fired in anger. Colin said that what he remembered of that first mission “was actually passing a Whitley while everything else seemed to be passing us, the smell of cordite in the target area (it became very familiar) and a numb bum after over 8 hours sitting on parachute straps.” By then he had 299.45 hours in his log book. After a week’s leave in Scotland he was posted from Cottesmore to 44 (Rhodesia) Squadron at RAF Waddington. This was the first squadron in the RAF to be equipped with Lancasters. A couple of months before his arrival, the squadron had lost five of the six aircraft it had sent on a daylight raid on Augsburg, after which John Nettleton was awarded his VC. Until it was time for command training, the newcomers flew as co-pilots on operations. During this period Colin flew missions to Saarbrucken on 29 July (291 aircraft of which nine were lost), mine-laying to Bordeaux on 5 August, Mainz on 11 August (154 aircraft of which six were lost) and mine-laying again on 13 August in the Baltic. On 7 September Colin finished Manchester flying and thereafter was assigned to Lancasters. At the end of September he was assigned to B Flight, where each crew had its own aircraft. Colin had a Canadian rear gunner, with the rest of the crew being English. He was assigned Lancaster W4125, KM-W, and flew missions to heavily-defended targets at Wismar on 1 October and to Krefeld the following night. The Wismar raid consisted of 78 Lancasters of which two were lost; but Krefeld was much larger with a mixed force of 188 Wellingtons, Halifaxes, Stirlings and Lancasters, of which seven were lost. On the nights of 5 and 6 October he flew missions to Aachen and Osnabruck. Colin flew the five hour mission to Aachen with the autopilot unserviceable and the number 2 engine having to be feathered in-flight, then unfeathered for the landing. The Osnabruck mission consisted of 237 aircraft, of which 68 were Lancasters. Six aircraft were lost. On 13 October he had a six hour mission to Keil as part of a force of 288 aircraft, of which 82 were Lancasters. The objectives were the docks where the Prince Eugen and Scharnhorst were berthed. Reportedly at least half of the bombing was decoyed to open countryside, and part of the decoy strategy was to withhold defensive flak fire to make identification of the target more difficult. Perhaps this was partly why only eight aircraft were lost. Three Lancasters in a photographic shoot on 29 September 1942. Colin Watt is flying the lead aircraft KM-W. Shortly after this photograph was taken, both the other two aircraft and their crews were lost on operations. After these operations on German targets, they had a week of low level formation practice around the country, which Colin said was a lot of fun but very tiring. On 22 October, they went to Genoa in a force of 112 Lancasters as the Battle of El Alamein was about to start. No aircraft were lost. two days later they went to Milan in daylight with 88 Lancasters and, on this occasion, three aircraft were lost. On this mission Colin experienced a number 3 engine failure on the outbound leg but elected to continue to the target. It was a long, slow return from the target on three engines, through flak over Le Creusot and with the autopilot also unserviceable. One can only imagine his fatigue on returning after just over ten hours in the air, particularly since he had already flown a nine and a half hour mission to Genoa so soon before – and had to divert to Oakington on the return of that mission. 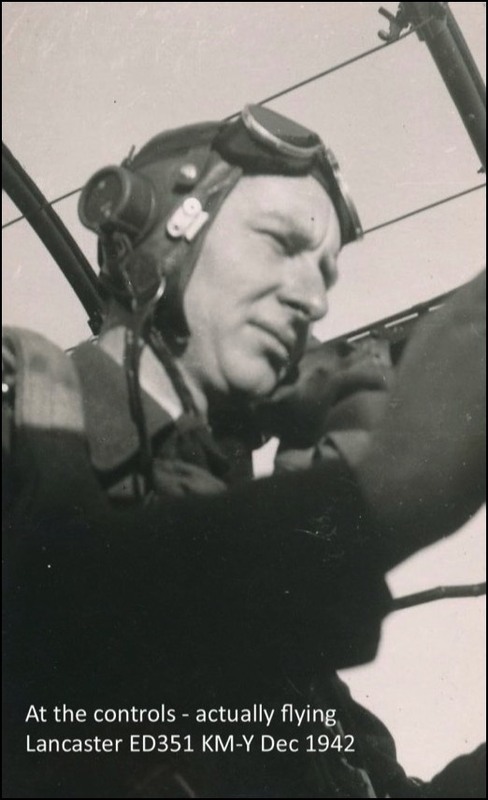 On 6 November Colin was informed that he had been awarded the Distinguished Flying Medal. His next three missions were all to Genoa. His diary reported searchlights and heavy flak and during the 13 November mission, KM-W was hit in the bomb bay doors. This mission also required a diversion to Manston on return because of weather conditions at Waddington, and Colin was unable to return the aircraft to Waddington until 15 November. His next mission was on 20 November to target the Fiat factory at Turin. This was the largest raid yet to Italy, consisting of 232 Lancasters, Halifaxes, Stirlings and Wellingtons, of which three aircraft were lost. Again, he had to divert on return, this time to RAF Snaith in Yorkshire. On 15 December Colin was commissioned with the rank of Pilot Officer. His operational tour finished with three more missions in his newly-assigned aircraft KM-Y: to Essen on 3 January, then Berlin on 16 and 17 January. The Essen raid consisted of only 3 Pathfinder Mosquitoes and 19 Lancasters, and was a continuation of the Oboe-marking experimental raids. Oboe was a blind bombing device fitted to the pathfinder aircraft and controlled from ground stations in England. Two ground stations transmitted pulses that were received by the aircraft and retransmitted back to the stations. The aircraft receiving the Oboe signals used the pulses to stay on track to the target. The ground stations calculated the aircraft’s position from the return pulses and then transmitted a signal at the precise moment the target-marking flares should be released. Three of the 19 Lancasters on this raid were lost and Colin’s aircraft was holed in the perspex above his head. This was the first attack by main force aircraft guided by Oboe equipped pathfinders. Oboe went on to be used for the rest of the war. 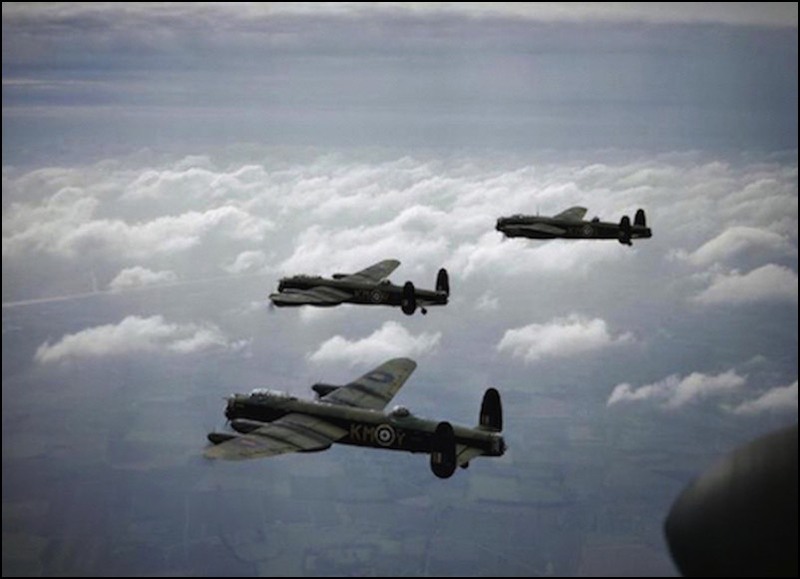 The 16 January raid was the first on Berlin for 14 months and the first all 4-engined bombing force, consisting of 190 Lancasters and 11 Halifaxes. Flak was light because about half the personnel of the Berlin flak units were away from the city on a course and only one Lancaster was lost. On Colin’s aircraft, mid upper gunner Eddie Harrold fell victim to hypoxia when his breath condensation froze in his mask and blocked the flow of oxygen. The flight engineer and wireless operator had to lift his unconscious body out of the turret – no mean feat from chest height in the confines of the aircraft – lay him out on the rest bed and administer oxygen until he recovered and resumed his post. The following night was tougher. The routes taken to and from the target by 170 Lancasters and 17 Halifaxes were the same as on the previous night, which helped the German night fighters find the bomber stream. Nineteen Lancasters and three Halifaxes were lost as a result. Colin was unscathed but his aircraft was boxed by flak on both sides, the autopilot was unserviceable and he had to divert was to RAF Castlecamp on return. Colin’s operational tour included 23 completed missions totalling 170 flight hours. His next posting was to Wigsley, which was part of the Heavy Conversion Unit of 5 Group. There he instructed on Manchesters and Lancasters. Then to Syerston, the 5 Group Lancaster Finishing School. At the end of March 1944 he was posted home to fly Liberators and add experience to the four-engine squadrons being formed in Australia. This was less than three months before D Day, which he was bitterly disappointed to be missing. When he left the UK, only three of the fourteen pilots from 11 Course had survived. Two of Colin’s crew were subsequently killed. Mid-upper Gunner Eddie Harrold on the night of 2 February 1943, in a collision with a Halifax 20km SSW of Eindoven, and Jack Money, the flight engineer, shot down by a night fighter off the Brest Peninsula after a raid on Turin on the night of 10 July 1943 with Wg Cdr Nettleton VC. The remainder, Rear Gunner Tex Campbell, Bomb Aimer Tich Hiscocks, Observer Johnnie Charnock and Wireless Operator Frank Walshaw survived the war. Tich Hiscocks won a DFM with another squadron. Colin’s return home was by sea to New York, then across the States by train to Sacramento and Fairfield-Suisun, the American Air Transport Corps jumping-off point for the South West Pacific. He was crewed up and given a new Liberator, which they tested and flew back to Australia from 27 May to 2 June 1944. Leave followed, then a posting to Tocumwal on Liberators, that he found to his disgust was as an instructor. Serviceability was poor and they spent a lot of time playing bridge in the sun while the second front was rolling in Europe. They were not happy, so in September 1944 when the government released Dakotas to the airlines, Colin applied to fly them. He was taken on strength of Australian National Airways on 8th October 1944. There followed a distinguished aviation career with ANA and Ansett (Ansett took over ANA in 1957), first flying DC-2s, DC-3s, DC-4s, DC6-Bs and Viscounts, then 14 years on B727s. In October 1987, Colin was offered the job of flying the Southern Cross Replica VH-USU on a country-wide promotional tour. The replica was the brainchild of John Pope, Bill Whitney and George Barnes, who set out in 1980 to build a replica of Charles Kingsford Smith’s Fokker FVIIB-3M Tri-motor. They had achieved a federal grant of $150,000 in 1979, formed a fund-raising body called the Southern Cross Museum Trust and a company they called Famous Australian Aircraft to build it. The aircraft was a faithful replica with the exception of the substitution of variable-pitch propellers, 300hp Jacobs radial engines to replace the original 220hp Wright Whirlwinds, an updated undercarriage, brakes, a tail wheel to replace the original tailskid and modern heat-shrunk synthetic fabric to replace the original cotton. The frame was also updated from mild steel to molybdenum tubing and modern cockpit instruments were installed. Soon after the launch the aircraft was chartered by the ANZ Bank and various other sponsors to undertake a national tour to raise funds for the Royal Flying Doctor Service. Colin undertook 6hr 5min of endorsement training between 21 September and 2 October 1987, then set out on 2 October with a young co-pilot Peter Gardiner on a three-month tour that included all the capital cities and a large number of regional and outback centres. They started off with a return flight to Broken Hill, then up through the centre to Darwin, then counter-clockwise around the coast to Perth and back to Adelaide on 30 October. This involved twenty landings and 63 hours of flight time. They set out again immediately on 1 November through Victoria, then up the east coast to Sydney and onwards through Queensland up as far as Cairns. Then back via New South Wales to Canberra, the Riverland and finally back to Adelaide on 29 November – adding another 27 landings and 47 hrs 50 min of flying time. They were off again on 2 December on a return trip to Renmark and Mildura, then to Point Cook after a few hours of endorsement flying at Parafield, then around Tasmania and back through country Victoria and the South East to Parafield again on 21 December. This added 13 landings and 29hrs 36min flying. All in all, they flew on 58 days between 2 October and 21 December, visited 53 centres and flew 140 hrs 26 min. In 1990 it was decided to take the aircraft over to New Zealand. This was a major undertaking involving the installation of two 600 litre tanks in the cabin and Tracor Omega Navigation. They spent 36 days touring around New Zealand, visiting air shows at Ardmore, Blenheim and Gisborne and some thirteen towns and cities throughout both Islands before departing from Whenuapai via Norfolk Island to Brisbane on 7 April. Colin flew the replica intermittently throughout 1991, flying on 16 days on promotional flights over Football Park, Adelaide Oval, Oakbank, along the beaches and to the Jamestown Air Show. His last flight in the aircraft was on 3 October 1995, by which time he had accumulated 319 hrs 54 min, of which 227hrs 03 min were in command. Colin also became an accomplished glider pilot. He spent a week training at Waikerie Gliding Club in November 1977 in preparation for retirement and went on to accumulate nearly 260 hours in nine glider types between then and his last flight on 28 July 2006. He made a number of long distance flights during this period, including several over 300 km from Gawler to Jamestown and return. 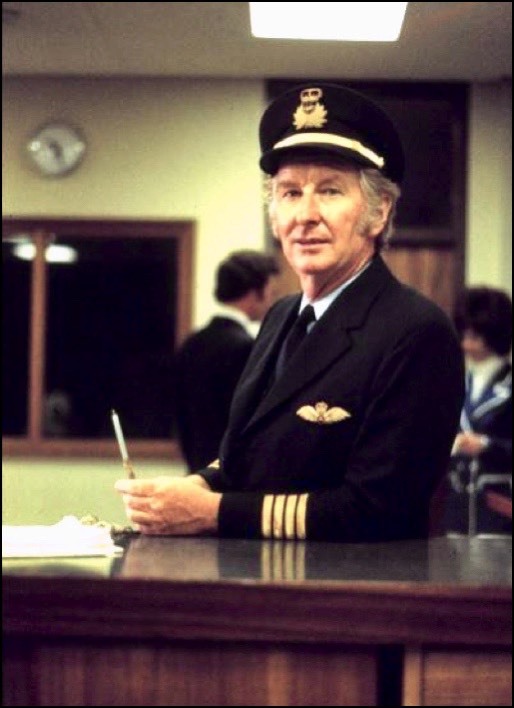 Over his long career, Colin accumulated almost 29,000 flying hours on 21 aircraft types. He is a member of the RAAF Association, was a long-term member of the Civil Aviation Historical Society SA, and travelled every year to the UK for 44 (Rhodesia) Squadron reunions right up until 2010. 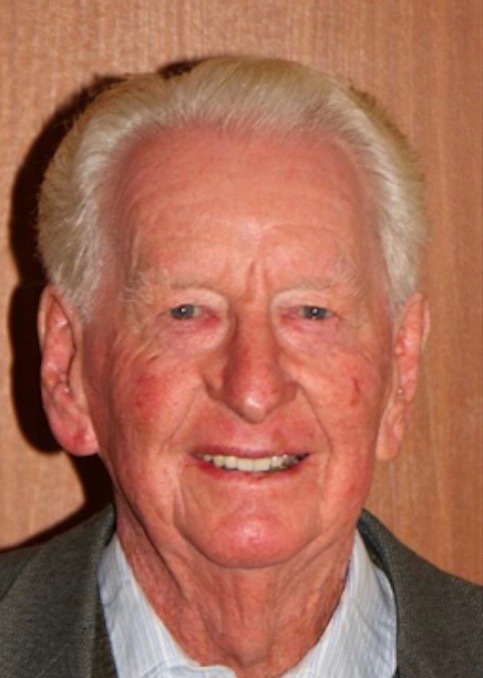 He was elected Honorary Vice President of 44 (Rhodesia) Squadron Association and in 2014 he was made an Honorary Member of the South Australian Aviation Museum in recognition of his contribution to aviation. Colin has had a lifetime commitment to the child retardation sector, supporting the Mentally Retarded Children’s Society, the Australian Association for the Mentally Retarded and Minda as a lifetime board member. In 1979 he was awarded the Order of Australia Medal (OAM) for community service.